Summit participants explored issues from creating incentives to encourage businesses to conduct more job training to the benefits of hiring ex-prisoners. Jon DeWys spent four years on a local school board and has a daughter who’s a senior in high school thinking about different career tracks. He also is president and CEO of DeWys Manufacturing near Grand Rapids, a firm that has sometimes come up empty-handed while trying to hire skilled workers. So DeWys has seen the barriers that keep workers – and businesses – from getting ahead: lack of trained workers, low-wage jobs, parents resistant to allowing children to explore a skilled trade, among them. So roughly three years ago, DeWys’ company launched 12-week programs called “DeWys University” to train workers in welding and other skills. And then the company gave all its 100 workers a $1-per-hour raise to improve their quality of life, along with incremental increases for completing additional training. “Our workforce development started with a crisis,” DeWys said. But he said the investments are paying off in lower employee turnover and better trained workers. 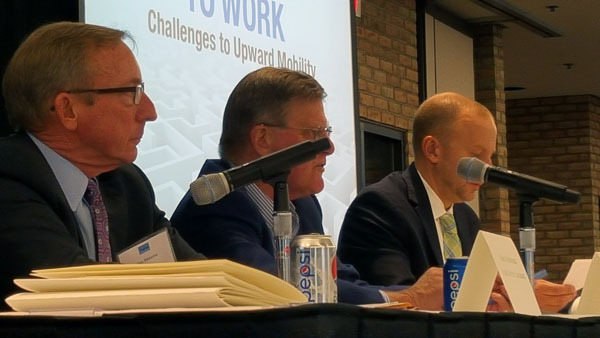 DeWys was among a dozen panelists at a conference Tuesday at the Grand Valley State University campus in Grand Rapids that focused on career opportunities and challenges to upward mobility in the state; in other words, ways to help Michigan workers get ahead. The report from the Center (the parent organization of Bridge Magazine) is based on the input of more than 5,000 Michigan residents this year, through 149 community conversations across the state, two telephone polls, two online surveys of employers and educators and an online panel from December through May. On Tuesday, in a brisk morning of four round-robin panel discussions, employers, experts and educators explored issues from cost incentives to employer training to the benefits of hiring ex-prisoners to the antiquated opinions among some parents about sending their children to trade schools. These issues are especially critical now in Michigan because although the unemployment rate is below the national average for the first time since 2000, wage data show that on average Michigan pay is falling and many residents are falling further away from the American Dream. Businesses that consider moving to or expanding in Michigan are most concerned about the skill level of Michigan’s workforce, said Stephanie Comai, director of the Michigan Talent Investment Agency. “They’re not asking about our tax structure, environmental regulations … the number one question is, ‘Am I going to be able to find the talent I need,’” in Michigan? In the “Getting to Work” polls, some residents questioned the quality of services available through workforce development agencies, and a vast majority of workers pointed out other hurdles to upward mobility – such as not having necessary skills and too few jobs that offer a livable wage. More than 70 percent of residents agreed that basic job skills training for workers of all ages needs to be expanded; retraining scholarships for displaced workers are needed as well as are paid internships for young people. The “Grow Detroit’s Young Talent” program was featured at Tuesday’s event because it offered job training for 5,000 young people. The youth, from low-income households, learned soft skills on how to hold a job and worked in summer positions such as landscaping and secretarial jobs that provided money for their families, said Dierk Hall, president and CEO of City Connect Detroit, a nonprofit that focuses on supporting children and families. “Employment opportunity and exposure is necessary. The difficulty is getting employers to let the kids on site because they don’t know how to deal with 14 to 17-year-olds,” Hall said. Duane Berger, a special project assistant in the governor’s office, said businesses have to get a better understanding of how much untrained, low-wage workers can hurt their bottom line due to high turnover. Virginia Krolczyk, a counselor at Utica High, said that if a student wanted to job shadow a worker or get an internship, she wouldn’t know how to help that child. She would have to refer them to another administrator who deals with the school’s work programs. That shows how schools are stratified, she said. Children are shuttled through either a vocational or college track with too little opportunity to explore and too few counselors who know how to help them all, she said. Kent Innovation High, a Grand Rapids school that opened in 2011 and focuses on project-based learning, was highlighted as a successful partnership between employers and schools training the next generation of workers. Brandy Lovelady Mitchell, principal of Kent Innovation High, said the school has connections to about 50 businesses. “We will all profit by or pay for what they become,” she said of children, quoting writer James Baldwin. Still, parents are a huge barrier to helping kids to choose skilled trades jobs that pay well, summit participants agreed. David Muir, president of Paragon D&E, a manufacturing company in Grand Rapids, said his firm worked with community college officials to develop a curriculum to train workers. There are plenty of skilled trades jobs that pay $50,000 with training and about four years experience, but the hard part is finding young people to train to replace the aging workforce, he said. “It’s very easy to get kids excited when you get them in the building. The problem is, parents won’t let them go into the building,” he said. Kevin Stotts, president of Talent2025, crystallized the importance for collaboration among parents, schools and employers: “Ninety-five percent of the jobs in this region will require post-secondary (education). That’s where the puck is going,” he said. Stotts also mentioned a challenge that transcended the report and the day’s discussion: the need to address low-education and high-unemployment rates among the African American and Hispanic work force. Ken Sikkema, senior policy fellow at Public Sector Consultants in Lansing and a former Michigan Senate Majority Leader (who has done work for Bridge's publisher, The Center for Michigan), gave summit participants political advice on ways to get Michigan’s Republican-led legislature to address issues surrounding career upward mobility. Further increasing the minimum wage is a non-starter in Michigan, he said, but reinstating the earned income tax credit is a possibility. The key is to frame the debate in terms of creating opportunities for upward mobility and to avoid engaging in debate about income redistribution. “If you start (conversations) at the right place, you can make progress,” Sikkema said. Summit attendees said they left Tuesday’s conference with new information. Tony Warren, an educational consultant in the Battle Creek area, said he would like to see a “crayons to post-secondary approach” to career opportunities that exposes elementary school-age children to options for their future. “What needs to take place is a comprehensive understanding of what we believe is college-ready, career-ready for our state,” he said. Jennifer Searls, career development coordinator for Branch Intermediate School District, was encouraged that progress is underway to get more career technical education in schools. “It’s going to change and I have to be patient and participate positively in the conversation,” she said. Gov. Rick Snyder will be among a parade of high-profile guest speakers at the final “Getting to Work” summit taking place in Lansing on Nov. 2. The discussions will focus on college value and affordability solutions. The unions used to do this kind of apprenticeship training but now our Republicans have pretty much eliminated unions. Look at Germany some time and the role of the unions and see how this could have worked if ideology had not gotten in the way of logic and things that actually worked. Now there's the thrust to turn many of our educational systems into worker training schools that the public pays for and the corporations benefits from (the 'privatize profits, socialize costs' model). With everyone becoming a no benefits (or only those the public finances) 'contractor' and with training costs becoming public costs we're almost to the nirvana that the corporations want. They have the monopoly power, the power to finance the election of those who favor them and now the only remaining piece is the workers part (aka serfs). Good to see the Bridge supporting the corporations and the GOP in this final push to rid us of the lazy, whining middle class. What?? Republicans eliminated Unions??? Unions are down because heavily unionized businesses lost or reduced employees (except for government unions!!) You give Republicans too much credit. Stop looking for conspiracy theories and bogymen. Of course parents don't want their kids taking an apprenticeship, they've been listening to Obama, reading stuff like some past Bridge articles and getting rid of all high school shop classes. All kids need to get BAs! This way they can take 4,5,6 years and $100k to get a worthless major and then get a $10 hr. job at Starbucks. At least they don't get their hands dirty. How does reinstating the EITC create opportunities for upward mobility? Seems to me that it would do the opposite by making folks more comfortable being and remaining poor. Ken needs to explain how that works better. Matt, the reality is that the biggest thing holding many low income workers back is a lack of resources to get to the next level. They may not be able to afford day care services, or educational advancement. Their car may be broken, and you know that Michigan's transit system overall is pretty bad (and the Legislature is refusing to provide any transit dollars as it considers how to boost transportation spending in the state). A few dollars from the EITC can help. The state in the Midwest with the lowest poverty rate and the lowest unemployment rate is Minnesota. It also has a very generation Earned Income Tax Credit, and provides unemployment benefits that are higher and last longer than in Michigan. How can this be so? Well, in Michigan, the pressure now is to take the first job that comes along, regardless of whether it is the right job for you or how much it pays. So people often take and leave jobs more rapidly. In Minnesota and other more enlightened (and low poverty) states, a person can find the RIGHT job, often at a better salary. We have proven in Mississippi that beating up poor people and the unemployed only gets you more poor unemployed people. Why do we expect any difference when we adopt those same policies in Michigan, as we have in the last decade? Why are people so sure it is only a money issue? My concern is that when everything is distilled down to one thing, money, it takes the individual/student out of the process and makes it the responsibility of others. Too many times I have seen things that are provided to people at no cost being used less effectively and significantly undervalued. I have also found when people are given things that others who have sacrificed to earn them, those making the most sacrifice question themselves and the system, wondering if the value is placed more on who a person is rather then what one has done. I have found, myself included, that the individual is what is holding back the individual. Lack of money can make the path harder, the individual may have to invest/sacrifice more, but they can travel that path and be successful. Hi David I'm not certain that your comparision of Michigan and Minnasota is that good of a lesson, we are very difffernent populations cultures and economies. When comparred to North and South Dakota, right next to Minn and more similar, door your comparrison doesn't look so great (except for much higher taxes in Minn!). Much of Michgan's most troubling poverty has a very generational nature, I'm curious if that's the same in Minnesota? David, those of us who are residents of other states and only spend the summers in Michigan also pay 18 mils over Michigan residents. We also don't get to vote on all the small "it's only 70 cents per day for the average homeowner" millages that they always cram onto the least attended ballots. So between the extra property tax and all the added millages that we didn't get to vote on, I'd guess I'm paying about $5,000 extra per year for which I have no vote and no need for any of these extra services. Am I mad, you bet. And I'm just an average retired schmuk with no pension. If you're paying 18 school mills and, say, another 7 in voted millages for 25 additional mills, to pay an extra five grand in taxes you'd have a taxable value of $200,000. So, your VACATION home has a market value of close to half a million bucks. I think you'll find little sympathy for your plight from the average Michigander. Hey! My husband and I own our own home, and are beyond broke! (You refer to homeowners as being richer). You have to be dirt poor or filthy rich in this state/country to survive/succeed!! Both college educated and both fired with no reason given. My termination was long ago, and we recovered alright. My husband, on the other hand, has been terminated from two jobs in the last two years for reasons such as, "You seem unhappy in your position." Companies can fire you for anything, even when you do your job, are successful in what you do, etc. To me, that's utter BS!! I feel all jobs should be protected in some way shape or form, as unions protect their people. Everyone should have protection from the money hungry corporations that exist today!! It's heart breaking and anxiety laden to endure joblessness for no other reason than the rich get richer and the middle class become extinct. Michigan is a horrible state to reside in!! I know my 17 year old son, a junior in high school, can't wait to escape this state! Quite sure my husband and I will do the same once our son has decided where to go to college. By the way, he will probably attend a university out of the state of MI! Additional training and a $2,000 raise for every worker got the owner a better workforce? Why, color me shocked!